(ENLGISH) Joseph Hunwick has spent twenty years as a professional photographer, specialising in documentary, nature and fashion photography. His work appears within and on the cover of publications such as Conde Naste Travel, The New York Times, The Tatler, Marie Claire, and the Telegraph Magazine. He is now based between London and Barcelona … more about Joseph Hunwick here. Lara Ubago is from San Sebastian. She is self- taught and speaks Spanish, French, English and Catalan. She has worked as a fashion stylist since 1981, contributing to internationally recognized magazines, working with many different photographers. She has developed corporate image for both brands and designers, taking care of the production of photo shoots, catalogues and campaigns. She has also worked as Art Director, producer and stylist for fashion shows… more about Lara Ubago here. (SPANISH) Itfashion.com “nació en 1999 producto de los sueños infantiles de Mireia Sabanés y Estel Vilaseca. Después de interrupciones, idas y venidas, en 2006 reemprendemos el proyecto para no parar. En él recogemos, a modo de apuntes, todas aquellas informaciones que nos alimentan y nos transportan a nuevos mundos y realidades. La moda, una excusa para soñar”. 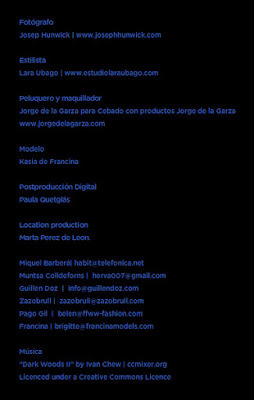 Más sobre It fashion aquí.